Asda ran out of pork mince which was unfortunate because I was making pork and ginger noodle soup for tea. Then I remembered the mincer I had inherited with the house that was residing in a dark corner of the cellar. I didn’t even know if I had all the right pieces but living dangerously I decided to buy pork steaks and see if I could unearth the mincer and get it to work. One trip to the cellar later and I had a very heavy mincer in little pieces waiting to be washed and assembled. Once I had completed this task, having little mutter about that’s why prepacked mince was invented, I was ready to begin. 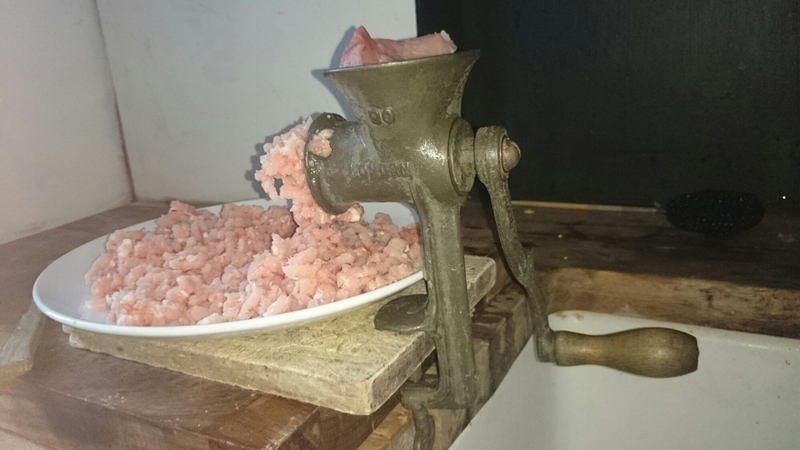 As the first minced meat oozed out of the front of the mincer I felt strangely empowered. Take that asda, you may not have mince but that is ok because I can make my own. It transpires I can also grind my own coffee beans, once the mincer has been totally cleaned and dried of course. I love the smell of freshly ground coffee, it definitely beats the smell of freshly ground pork. Bring to the boil and simmer 500ml chicken stock with 2tbsp tamari and had a bunch of spring onions chopped. Add 1tbsp mirren, 2cm ginger and 2 cloves of garlic. Simmer For 10 mins then strain and reserve. Boil two carrots cut into strips, brocolli, baby sweetcorn then add as much noodles as needed to feed however many eating. Cool noodles and veg and reserve. Mix minced pork with spring onions 2xtbsp tamari, 2x cloves garlic and 2cm ginger. Form into balls and add to the reserved soup. Cook for 15 mins, add some chopped up spring greens or kale and the noodles and veg. Cook for five minutes then serve in bowls. Yum.